It might not be much, but Gameloft’s delayed Modern Combat 5 title finally has a name – “Modern Combat: Blackout” – though information concerning a possible release date, pricing, and availability are still unknown. The other information relayed today consists mostly of confirmation of previous news. The game will begin in Venice, Italy where your main character Phoenix must stop a well-armed terrorist group from transporting weapons of mass destruction. As a reminder, Gameloft has released a Modern Combat game each year since the first title launched on the App Store, however in 2013 the anticipated Modern Combat 5 was postponed until 2014. 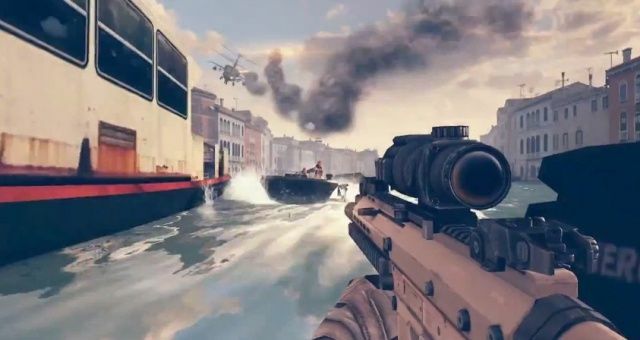 The change to Gameloft’s release schedule was made in order for the developer-publisher to “fully achieve” its vision for the title, and since then, all has been quiet on the Modern Combat 5 front. The news of the game’s confirmed name is promising, and it of course suggests that Gameloft is making progress on the title. Despite this, however, it nevertheless seems we have a little longer to wait until Modern Combat 5 invades the App Store. In the meantime, see: Adobe Updates Photoshop Express For iOS: Adds iOS 7 Design, New Features, The Latest iPhone 6 Dummy Mould Shows More Of The Same, and AppAdvice Daily: Horrify Your Workout With Zombies, Run.